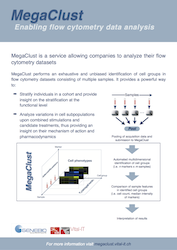 MegaClust: a service allowing companies to outsource the analysis of their flow cytometry datasets. 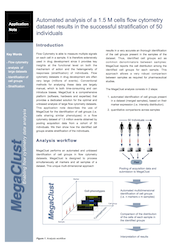 MegaClust is developed and operated by the Vital-IT Bioinformatics Competence Center. 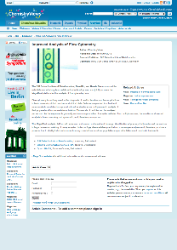 Vital-IT maintains the high-performance computing (HPC) and storage infrastructure of the Swiss Institute of Bioinfomatics (SIB). A software implementation of the MegaClust analysis algorithm that is optimized for massive parallelization. An IT infrastructure consisting of 1’500 processors. Multidisciplinary expertise required for optimal data analysis (ranging from software engineers to biologists). The MegaClust analysis workflow is designed to be easily and quickly adaptable to the specificities inherent to each dataset. MegaClust is data agnostic. Sensitive information regarding individuals and markers are not needed and can therefore be removed from the data submitted to MegaClust. MegaClust provides multiple output formats ranging from PDF summary reports to detailed Excel sheets. Stratify individuals in a cohort and provide insight on the stratification at the functional level. Analyze variations in cell subpopulations upon combined stimulations and candidate treatments, thus providing an insight on their mechanism of action and pharmacodynamics. 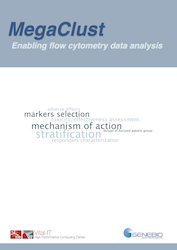 This application note describes the use of MegaClust for the identification of cell subpopulations in a flow cytometry dataset of 1.5 million events obtained by pooling acquisition data for 50 individual samples. 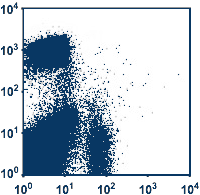 It then shows how identified cell subpopulations enable stratification. This application note describes the analysis with MegaClust of a CyTof dataset of 2.25 million cells. 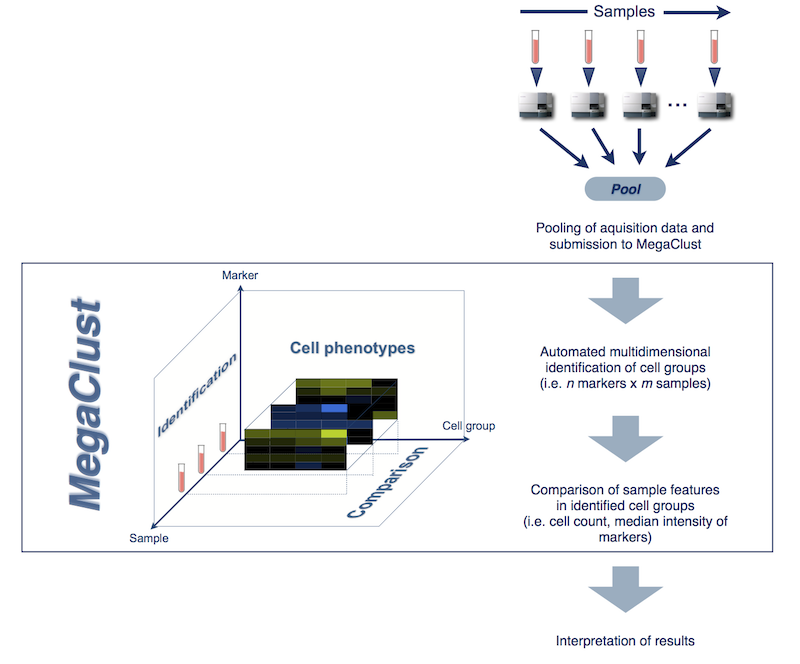 It illustrates how the unique approach used by MegaClust to identify cell populations across samples provides a very powerful tool for analyses of drugs mechanism of action. 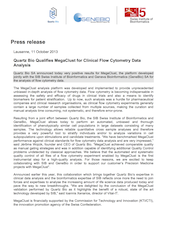 Quartz Bio SA announced today very positive results for MegaClust, the platform developed jointly with the SIB Swiss Institute of Bioinformatics and Geneva Bioinformatics (GeneBio) SA for the analysis of flow cytometry data. 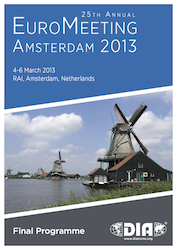 Amsterdam, March 4-6. Do not hesitate to visit Quartz Bio booth #643 to get information on MegaClust. 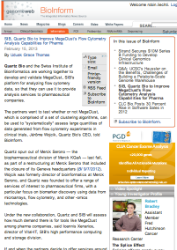 Quartz Bio and the Swiss Institute of Bioinformatics are working together to develop and validate MegaClust, SIB's platform for analyzing flow cytomery data, so that they can use it to provide analysis services to pharmaceutical companies. 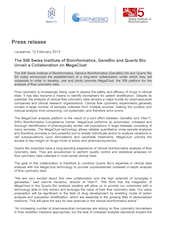 The SIB Swiss Institute of Bioinformatics, GeneBio, and Quartz Bio announced the establishment of a long-term collaboration to develop, use, and jointly promote the MegaClust platform for the analysis of flow cytometry data.